RadioShack’s Andreas Kloden won Thursday’s tough 193km fifth stage of Paris-Nice in Vernoux-en-Vivarais in the Ardeche ahead of Samuel Sanchez (Euskaltel), and now leads the Olympic road-race champion by four seconds overall. While Kloden and Sanchez made the day’s eight-man winning break up front, it was a day of yo-yoing on and off the back of the bunch for overnight race leader Thomas De Gendt (Vacansoleil). The Belgian had enjoyed a brilliant, but tough, week at Paris-Nice up until now, winning, losing and then regaining the yellow jersey – but today’s hillier stage spelled the end of the road for his chances overall. The eight-kilometre-long Col de la Mure coming towards the end of the day’s stage was what everyone was talking about, thanks to its 12 per cent sections, but it was on the descent of the Col de Comberon, ahead of the Mure, where the race came alive when Francaise des Jeux piled on the pressure at the front of the bunch to claw back Lieuwe Westra (Vacansoleil) and Ag2r’s Hubert Dupont – the remnants of the day’s breakaway. The FDJ effort took four of their riders clear of the peloton. And when Pierrick Fedrigo, Sandy Casar, Cedric Pineau and Jeremy Roy were joined by Wednesday’s stage-four winner Thomas Voeckler (Europcar), Katusha’s Yuri Trofimov and Simon Spilak (Lampre) to build up a 40-second lead at the head of affairs, things began to look dangerous. However, with the Col de la Mure always destined to play its starring role, the race regrouped once more on the steep lower slopes, and it was Astana’s Roman Kreuziger who was the first of the big names to have a dig on the climb, closely policed by Spilak and HTC’s Tony Martin. 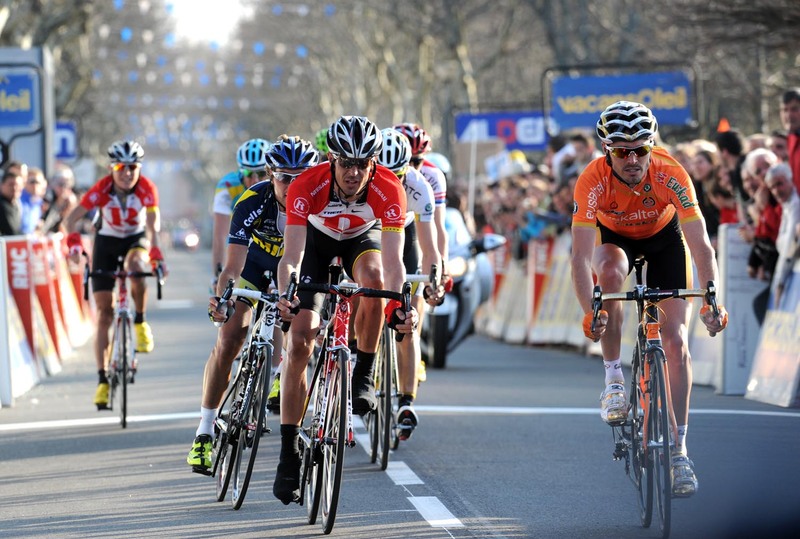 Vacansoleil’s Matteo Carrara was the next to go, and only Kreuziger’s team-mate, Robert Kiserlovski, could go with him. The pair were pegged at 12 seconds for the remainder of the climb thanks to sterling work from HTC’s Tejay Van Garderen, before his team-mate Martin, Rein Taaramae (Cofidis), Movistar’s Xavier Tondo, Euskaltel’s Sanchez and RadioShack pair Kloden and Janez Brajkovic were able to bridge to Carrara and Kiserlovski at the summit with nine kilometres of the stage left to race. This eight-man split turned out to be the decisive one, despite efforts by Sky’s Rigoberto Uran and Bradley Wiggins to drag the chasing group back into contention on the descent off the Mure and then the uphill drag to the finish. Up front, RadioShack’s Kloden and Brajkovic were the only team represented with more than one rider, but would they be able to make that numerical advantage count? Sanchez spent most of his time on the back of the group, but moved up as Martin drove on the front into the final 500 metres. Brajkovic then took over with Kloden stuck to his wheel, leading out his RadioShack team-mate for the victory, while what looked like a bungled gear change from Olympic champion Sanchez meant he didn’t quite have enough on the line to lunge and beat the German. Kloden has won this race before – back in 2000 – but has been a loyal servant to Lance Armstrong the last couple of years since the American made his comeback, first as team-mates at Astana, and then with RadioShack. Kloden’s last individual win came on the time-trial stage of the Tour of Trentino in 2009. Now, in yellow at the head of the race he won 11 years ago, he’ll be looking to add to his palmares once more, and should be one of the men to beat on Friday’s 27km individual time trial between Rognes and Aix-en-Provence.